Sir Reginald Beef Wellington O.B.E. Sir Reginald Beef Wellington OBE lives on the outskirts of Standard Falls, mostly keeping to himself. He has a few friends in the area, the most notable being Doctor Leghorn. His eccentric and slightly peculiar nature keeps him at arms length from most of the the towns inhabitants. “Top hole! And rather spiffing too actually”. 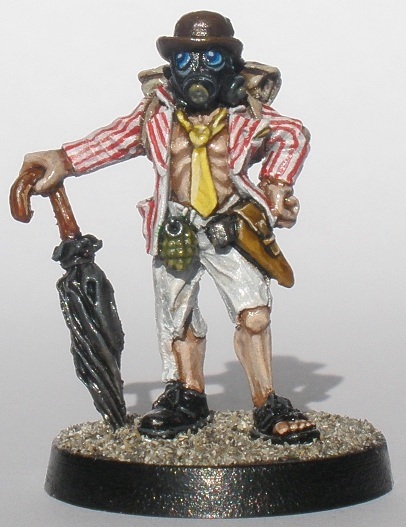 Reggie is the first post-apocalyptic figure that I have painted for quite a while, probably over a decade. As a child of the ’80s when post-apocalyptic movies were particularly in vogue I will always have a soft spot for the sub-genre. Reggie is a classic sculpt by Mark Copplestone currently for sale from EM4 as “0041 Gentleman Scavenger. Stunbrella. Bowler hat. Morningsuit (tattered)”. There is something about the “stiff upper lip” gas mask and torn morning suit look that is very appealing. Most versions of the figure that I have seen are painted to look like the figure is wearing a formal suit, usually black. Just for a little variety I decided to paint Reggie in a “boating” jacket, for that Oxbridge look. The figure always reminds me a little of Mr Bland (from Bland and Brass) in the Rogue Trooper comics from the 80’s. Since I painted and photographed the figure I have tidied up the stripes on the back of Reggies left arm. A few of them were a bit off. I also put a teeny bit of lichen on the rear of the base, but thats really hardly worth mentioning. I have a lot of post-apoc stuff in the pipeline, so more inhabitants of post-apocalyptic Standard Falls will be showing up here as time goes by. I’ve always had a keen eye for this figure. He looks so relaxed and at ease with the whole situation. Just another day at the beach, 50 years after they dropped the atomic bomb. You did a terrific job on him, especially with the gas mask and the eyes. I’m hoping to see the guy in the rabbit suit accompanying him. He is just too funny. I like the skin tone, what colors did you use? Thanks for the compliment. Its a fantastic miniature and no mistake. The stuffy, yet nonchalant look is brilliant. Loads to like. I think that pretty much anyone who enjoys painting toy soldiers would get a kick out of painting that guy. 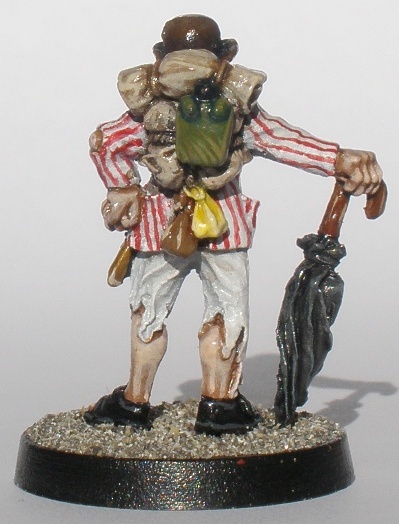 Although both are sculpted by Mark Copplestone, the rabbit suit guy is a “Copplestone Casting” while Reggie is an old “Grenadier” miniature, currently sold by EM4. I have the pack with the rabbit suit guy. Although the lot of them have been cleaned up and are ready for painting it is the bare chested doctor miniature from that pack that will be the next Standard Falls inhabitant on show here (the Dr Leghorn mentioned in the early part of the post). I am not certain about the colours used to paint Sir Reggies flesh ( I didnt record the exact colours for some reason. I probably painted the figure on a boozy Sunday afternoon and forgot…). I *think* that the colours used were GW Tallarn Flesh probably followed by a wash of Devlan mud, followed by Tallarn, followed by a Tallarn/OLD (early 90’s) GW Bronzed Flesh mix followed by Bronzed Flesh / White mix. It wasnt really blended but layered somewhat smudgily. If that makes any sense. Ok, so Tallarn Flesh, and then experiment with different washes. I usually mix Bronzed Flesh with Bleached Bone, but Tallarn Flesh is obviously the way to go for a natural pale white shade. Do you recognize all EM4 miniatures as being from Grenadier, or do they sell minis from different manufacturers? I am not an expert on old Grenadier stuff, so I dont now about the ranges that EM4 stock. I *think* that they are all old Grenadier. Tallarn Flesh is actually a reddish dark flesh tone, its just that it gets left very much towards the recesses only. Its a very handy colour (and its a GW foundation paint so it coveres very easily) but it wont give you a natural pale white shade on its own.